The 2018-2019 Albion College Reading Series, sponsored by the Albion College English Department, is back for second semester. The lineup includes authors who display a variety of deep themes in their work. The series will start with a presentation by fiction author Shannon Gibney on Jan. 31 at 5:30 p.m. in the Wendell Will room. Gibney’s 2016 novel See No Color follows the story of a teenage girl named Alex who struggles with establishing her identity as both a biracial young woman and as an up-and-coming baseball player. See No Color won the 2016 Minnesota Book Award in Young People’s Literature. Much of Gibney’s other works, including Dream Country, cover similar themes of race and changing racial identity through generations. In addition to being a published author, Gibney teaches critical and creative writing, journalism and American diasporic topics at Minneapolis Community and Technical College. 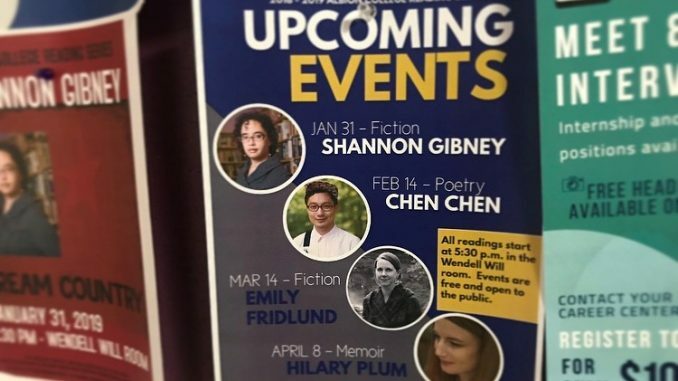 Poet Chen Chen will follow Gibney with a presentation on Feb. 14. Chen is the author of When I Grow Up I Want to be a List of Further Possibilities, a collection of poems which was longlisted for the National Book Award. He has won LGBTQ and general poetry awards as well. Some of Chen’s other works were documented in national poetry archives, including Poetry Tin House, Poem-a-Day and The Best American Poetry. On top of his successes in poetry, Chen is also the 2018-2020 Jacob Ziskind Poet-in-Residence at Brandeis University. Finally, memoir and creative nonfiction writer Hilary Plum will be capping off the series with a presentation on April 8. In addition to writing the novels Strawberry Fields and They Dragged Them Through the Streets, Plum also edits papers in the fields of international literature, history and politics, as well as the Open Prose Series at Rescue Press with Zach Savich. When not writing and editing, Plum teaches at Cleveland State University and is associate director of the university’s poetry center. All events are sponsored by the Albion College English Department and the Stockwell-Mudd Library. Each will be held at 5:30 p.m. in Stockwell’s Wendell Will Room.